As the 2019 elections approach, Governor of Edo State, Mr. Godwin Obaseki, and the Pentecostal Fellowship of Nigeria (PFN), have urged Nigerians to shun divisive speeches which create tension among the various ethnic and religious groups in the country. 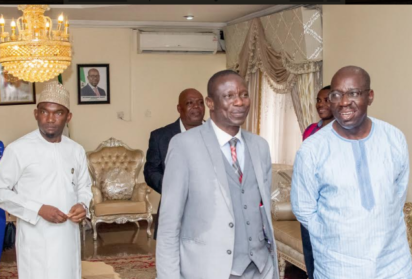 R-L: Edo State Governor, Mr. Godwin Obaseki; Deputy National President, Pentecostal Fellowship of Nigeria (PFN), Bishop Wale Oke; and Chief of Staff to the Governor, Chief Taiwo Akerele, during the courtesy visit by Bishop Oke to the governor, at the Government House in Benin City, at the Weekend. The cleric urged Nigerians to hold leaders accountable by ensuring political office holders deliver on campaign promises such as security, education and other dividends of democracy. He tasked political office holders to be more responsive to the people and urged those yet to obtain their Permanent Voter Cards (PVCs) to do so in order to participate in the forthcoming elections. The post 2019 polls: Obaseki, PFN urge Nigerians to shun divisive speeches appeared first on Vanguard News.